Miami: Eleda.Org Publications, 2012. ISBN: 978-1-877845-11-6. (290 pgs.) $24.99. 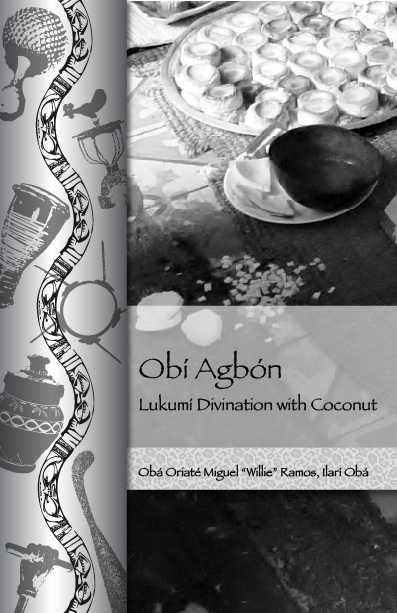 Obí Agbón is a ground-breaking exploration of Lukumí (Yoruba) divination with coconut and its historical evolution in Cuba and the Cuban diaspora. This study reviews the existing scholarship on the topic, offering critical and profound observations that are of major importance and relevance to the state of affairs of Lukumí religion in the XXIst century. In the process of analyzing the primary subject, the author book examines some of the more salient debates, internal discrepancies and worrisome, unprecedented trends that have challenged the Lukumí community through the years, and continue to do so in the modern context. Furthermore, while not dismissing the role of mythology and tradition, the author’s exploration presents a series of fundamental considerations, significant for both devotees and the scholarship, which are founded upon historical archival evidence as well as oral “texts”—the accounts of the members of the Lukumí community themselves. In the process, the reader gains valuable insight about the role of human capriciousness and inventiveness that so often lead to confusion, discrepancies and contention amongst Olorishas, and repeatedly upset or alter religious practice. The author’s dominion of the subject matter is supported by four decades of active participation as an Olorisha and Obá Oriaté, in the religion that has been part of his own family tradition for at least four generations. Moreover, fieldwork in Cuba and the Cuban diaspora, scholarly research and publications, participation in many conferences and symposiums, and contributions to several museum exhibitions, corroborate the author’s expertise and command of the topic. Surely, Obí Agbón will be an invaluable guide for the Olorisha and an important contributor to the scholarly literature on Lukumí religion. Given the book’s strong foundations, this study will certainly—and hopefully—lead to other levels of discussion that are of extreme importance given the growth, expansion and continual transformation of the Lukumí religion since the Cuban Revolution, which has allowed the religious system to respond to the needs of greater and significantly diverse national and ethnic communities that have joined its ranks. Undoubtedly, all forms of Yoruba religion are living traditions that, by their very nature, cannot remain static. Stagnation clearly presages the system’s demise. As a “living” entity, the Lukumí faith will—in fact, must—continually grow and evolve, actively and incessantly encompassing those elements that expand the religion’s character and applicability to the modern world, while simultaneously supporting its perpetuity. have a responsibility and an obligation to safeguard the religion’s essential core, whether or not its margins pursue (hopefully) positive interaction with the other traditions. Ultimately, whether these custodians accept or reject any transformative movements is immaterial, given the unrelenting character of the natural evolution that the various traditions must inevitably follow to respond to the modern world. At these junctions, it is vital that the community guarantees the constant and unremitting scrutiny of the fundamental components that make up the religions’ core as these elements interact with the concerns, changes and directions that will shape ritual and practice for generations to come. This book contributes to the ongoing debate, but most importantly if does so by ensuring that actively defending and guarding a religious legacy that must withstand the test of time and unremittingly demonstrate its capacity to advance beyond the obstacles that it encounters in its journey.